COSACOSA's Art and Civic Engagement initiative, Community Collections, explores Philadelphia's cultural histories and changing urban landscapes. Through community-based artist residencies, commissions, and media projects, Community Collections projects provoke accessible and insightful dialogues among city residents, while building collaborative forums in which to address the common and uncommon challenges of living together. Please click on images for enlargements with captions. Throughout 2018, our Serving Justice project explored relationships between individual rights, community responsibilities, and the equitable distribution of opportunity. Artists from divergent disciplines worked with residents of some of Philadelphia's most challenged neighborhoods to create new works advancing "liberty and justice for all" whether civil, social, cultural, or economic. Individuals experiencing homelessness, as well as those in transitional housing, formed the lead group of Serving Justice citizen artists. Corners & Crossroads reclaimed hidden histories and forgotten landscapes throughout Philadelphia. Working with COSACOSA artists, city residents researched and collected stories to interweave their experiences to build shared community narratives. Neighborhood art projects encompassed themes of immigation, cultural identity, displacement, and gentrification, expressed in multiple disciplines  from painting and sculpture to audio and digital art. How can we provide new opportunities for lifelong learning and intergenerational, intercultural exchange? Learning Curve explored connections among art, education, and civic participation while charting the progress of whole neighborhoods creating for the common good. The project also develped replicable models for teaching literacy, civics, science, and mathematics through the arts  based on the past two decades of COSACOSA's Art Smart initiative. 2015 marked COSACOSA's 25th anniversary and the 20th anniversary of the Healing Art Project, our initiative exploring relationships among art, health, and community. Throughout the year, our Lifelines project promoted art for healing citywide, in large-scale projects for healthcare facilites, in new public school curricula, and through block parties in diverse neighborhoods. Lifelines provided meaningful opportunities for all our city's residents to create art, while advancing community healing and public health practices. 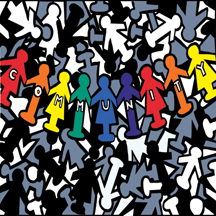 What makes a community liveable and sustainable? Growing United explored the process of placemaking as a reflection of individual and neighborhood aspirations and experiences. Planning and creating with diverse groups of Philadelphians, the project developed new green spaces as public art gardens in some of our city's most challenged communities. The gardens feature multidisciplinary artworks designed by local residents, including mosaics, murals, and sculptures, plus sound art installations of original songs and poetry, neighborhood histories, tall tales and comic anecdotes, and family remembrances. Our Pledge of Allegiance describes a nation "indivisible, with liberty and justice for all." Exactly what qualities and circumstances allow us to resolve conflicts and build community? Indivisible united Philadelphia's most challenged neighborhoods in identifying and sharing histories of mutual aid across time and cultures. Participants collaborated with professional artists to devise new ways to tell old stories while creating civil civic dialogue and cross-cultural connections through multiple artistic disciplines. Stories collected from around the region also were featured in Spare A Dime, an original multimedia song cycle about economic crisis workshopped by COSACOSA at the Philadelphia International Festival of the Arts. Home can be a physical site, a communal identity, or a state of mind. Home/Away from Home examined acts of neighborhood placemaking and differing definitions community  whether geographical, cultural, familial, and/or conceptual. From reclaiming the urban landscape to exploring historical parallels among place, poverty, and power, Home/Away from Home brought together city residents of diverse backgrounds (and more than 30 different ethnicities, many of whom were new immigrants) to build community through art-making. Change happens; the universe inclines to chaos. In a world where random acts of chance obstruct our force of will, how can we sustain our power and purpose? Changing Places explored individual and communal transformation through movement, images and stories collected from residents of ten very different Philadelphia neighborhoods. Changing Places created interactive spaces for neighbors to “step into each other’s shoes," from site-specific dance performances to travelling installations positive change. An ongoing virtual conversation juxtaposing the piece in its various incarnations with community interviews allows an even broader audience to become engaged in the work. Change in the Making explored the power of stories for COSACOSA’s 20th anniversary year in program year 2010-2011. 20 artists in 20 communities, in Philadelphia and abroad, gathered images and interviews on community, culture and change, creating opportunities for our constituents to reframe their own stories by sharing in the stories of others. Change in the Making globalized COSACOSA’s “dialogues through art” methodology and invented a new interactive template for community self-determination. Collected images and interviews are disseminated via a wiki-based "service learning through the arts" curriculum for city youth and a participatory theater dialogue game  ongoing, replicable resources for creating cultural change. To uncover new possibilities for ourselves and our communities, we must first learn how to make peace and share power. Peace, Power, Possibility! brought together youth from around the city to envision new methods to overcome obstacles, strive for success, and work together -- using photography, puppetry, poetry, and music. The project was created in conjunction with COSACOSA’s Arts Bridges program at the Julia de Burgos Bilingual School, teaching literacy across the curriculum. Arts Bridges was a five-year pilot project of the Philadelphia Arts in Education Partnership, supported by the United States Department of Education. Common Good explored crucial neighborhood issues (e.g., health concerns, gang violence, abandoned housing  as determined by community members) through visual art, filmmaking and new media projects. Common Good enabled participants to use collaborative art-making to raise awareness of neighborhood needs and assets. Through the creation and dissemination of video PSAs, residents became better equipped to proactively address their common interests and concerns. A touring installation of the film with the project mural, At the Table  a “moveable feast” of virtual and actual foodstuffs, examined poverty in North Philadelphia while showing food as a creative way to engender intercultural and intercommunity connections. environments which surround them. Working with community residents of differing ages, backgrounds and abilities, Telling Time, Telling Place transformed a vacant lot in one of Philadelphia’s most challenged neighborhoods into a small-scale green space. This Healing Garden honors the past leadership fo community elders while inspiring new leaders yet to come. The Garden features a variety of medicinal plants; a 38’ diameter Compass of Community mosaic, creating a public meeting and performance space; a meditational area, and an entryway formed by the four Pillars of Community from our Site and Sound project. Telling Time, Telling Place also resulted in a series of photographs and stories created by participants about the history and hopes of the community. With our Site and Sound project, North Philadelphia youth developed new methods for neighborhood problem-solving through multimedia art-making. A pilot project of Youth Visions for Stronger Neighborhoods, an initiative of National Learn and Serve America and CTCnet, Site and Sound worked to cultivate youth as vital assets to their communities’ long-term health and success. 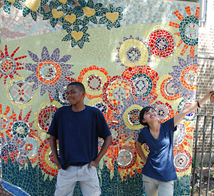 The project initiated a Community Development Plan for a 15 square block area of the city, while resulting in 1) four Pillars of Community sculptures defining the strong spirit, as well as the physical boundaries of the neighborhood, 2) a Voices of Community CD containing twelve original songs and spoken word pieces about issues of concern, and 3) a Visions of Community film mapping neighborhood history and existing assets. Masks embody our search for identity and place -- as individuals and communities -- and enable us to experiment with new roles and differing views. Mask and Metaphor brought together intergenerational and intercultural groups from Philadelphia’s Latino and Chinese communities to explore archetypal masks, myths and symbols from each culture. The project revealed similarities, celebrated differences, while utilizing traditional forms of mask-making to explore the issues of cultural assimilation shared by the two communities. Individually created masks were combined into brilliantly colored altars by the project participants, one installed permanently in each of the constituent neighborhoods. Through multiple art forms and intergenerational dialogues, Opportunity’s Gate investigated opportunities for advancement for young people living in North Philadelphia, and for North Philadelphia neighborhoods in general. The project celebrated the qualities of community leadership through a giant, collaborative public mosaic installation and a forty minute film created, performed and produced by North Philadelphia youth. Workshops for the project were hosted in collaboration with Opportunities Tower, a residence and community center for North Philadelphia elders, and our local Opportunities Industrialization Center, providing job training resources to city residents. During 2003, COSACOSA examined story-telling as "cultural grounding” -- social interaction that discovers, delineates, and disseminates both individual and community identity. Our Memory Mine project brought artists working from divergent disciplines (sculpture, sound art, and new media) into residence in Philadelphia's Nicetown-Tioga neighborhood, each to develop a piece exploring the residents' collective memory, history, experience, tall-tales, and folklore. Connection, a city-wide collaboration among Philadelphia youth, is site-specific to the connecting walkway between Philadelphia International Airport Terminals C and D. From outstretched human hands, a macrocosmic arc of light spans 80 feet of exhibition space, joining the two terminals both physically and metaphorically. 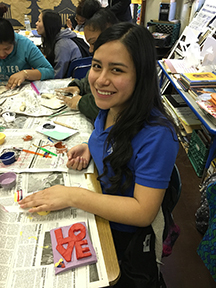 The arc is filled with over 1,200 hand-molded miniature clay sculptures created by young COSACOSA artists, depicting themes common to all our human experience, transcending the bounds of culture and community. Safe Harbor examined the relationship of a North Philadelphia hospital with its adjacent neighborhood  not just as a health provider, but as an open and accessible public space, meeting place, and community support system. Safe Harbor project participants -- including pediatric and adult patients, their families, community clinic visitors, and residents of the diverse neighborhoods surrounding the hospital  defined and created milagros, decorative metal amulets describing their own hopes, histories, and experience of healing. Over five hundred of these small, individual artworks cover and complete the finished sculpture, symbolizing the collaborative, community spirit through which it was created. Many divisive factions are at work in Philadelphia's Manayunk neighborhood. This sound installation collected the true voices of long-time Manayunk residents,new and old merchants, developers, and community leaders to examine changes in the seven years since COSACOSA's first artist commission at the site. 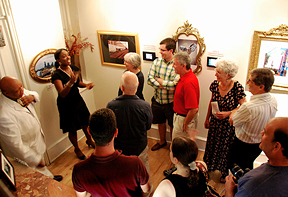 The resulting composition, interwoven with a narrative history of the area, attempted a genuine dialogue between the participants concurrent with the public exhibition of related paintings along the Manayunk Canal. “The woman's life journey became a circle -- child to her mother, mother to her child...” Mother, Child, Children explored both the experience of a woman becoming a mother and the child's journey to adulthood. The exhibition brought together twenty-two original paintings, drawings, and lithographs by artists including Bernadette Salnon-Buote, Sikkai Hansen, and Will Barnet. Installed at the AHERF Gallery, the images were echoed by strategically placed poetic texts, from William Wordsworth to Alice Walker,marking the viewers' path of discovery. Tom Palmore's work plays on incongruities between subject matter and background. Beyond the obvious ironies in his work, Palmore delineates the current plight of animals and their ecology. Wild Imaginings juxtaposed sixteen of Palmore's representative works with paintings created by pediatric oncology patients and children from Taller Puertorriqueño under his tutelage. 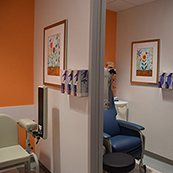 Journey transformed a Philadelphia hospital from a stark, white building to a welcoming environment through patient-centered and -created artwork. Artists from multiple disciplines created work community members exploring various journeys, implying both medicinal and community aspects, and examining the interrelationship among living things and each person's life-long process of growth, change, and healing. During 1995, (the 700 year anniversary of Marco Polo's return to Italy from China), COSACOSA explored how the disparate cultures and communities comprising the United States may have influenced each other both here and abroad, both currently and historically. Projects included the creation of a visual nexus of common cultural artifacts between Chinatown and the Italian Market along Philadelphia's 9th Street. Cultural Environments explored how communities are influenced by their surroundingenvironments. Through art-making, Philadelphia neighborhood residents examined local environmental issues and raised public awareness about the relationships between population, pollution, and neighborhood evolution. 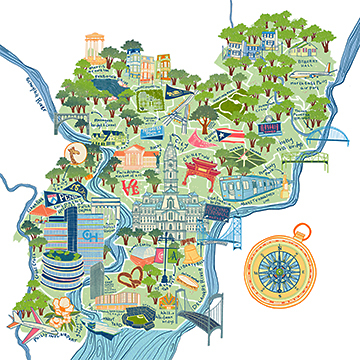 South Philadelphia neighborhoods are in transition. An uneasy co-existence has been struck between African Americans, European Americans, and new Asian immigrants. Several small groups of neighborhood women and children from different cultural backgrounds, along with monks from a local Cambodian Buddhist temple, met in workshops and discussions about their various histories. The groups then joined to make a quilt that represented each other, their common community and diverse cultures. The ancient Chinese built the Long Wall around themselves to prevent foreign invasion and to maintain a peaceful society. Today in Philadelphia's Chinatown both visible and invisible walls have been built around the community by outside forces. With new construction already on three sides, the blockade of the community came close to being completed with the erection of a federal prison next to the Holy Redeemer School, the educational center at the heart of the neighborhood. Chinatown residents created a tile mosaic permanently installed at the school entrance at Vine Street, sparking a broader awareness of the Chinese American community's struggle for survival and acceptance. The Olney area has long been a microcosmic representation of our city, and indeed, of our national ideal: different ethnic groups successfully living together. Olney residents and their children created a group sculpture investigating how people of different cultures envision their common community. Participants discussed, planned, and constructed site-specific miniature renderings of their Home-Space (broadly ranging from one's immediate neighborhood to the community-at-large) using articles found on the streets of Olney (recyclables, refuse, natural objects). The finished piece was installed at the local library. Philadelphia, the Manayunk Canal embodies its dissociated and disenfranchised neighborhood. The artists guided community members in the creation of a historical installation examining their problems as a "floating gallery" in the center of the Canal, featuring interviews with residents and developers pertaining to the disposability of individuals and environments. This new, experimental theater work by playwright Michael Hollinger examined the relationship of diverse Philadelphia neighborhoods with each other and with the monuments installed in their midst. Using statues to reveal issues from everyday concerns to matters of cultural survival, fragmented communities were mobilized and united through guided "confrontation" with actor-audience members. Workshopped and performed at six sites around Philadelphia, Statues was filmed by The Smithsonian's National Gallery of American Art as part of their Save Outdoor Sculpture! initiative. Common Myths explored the accepted fables of our society, from established cultural histories to everyday, modern-day personal rituals. New interdisciplinary works investigating the mythologies of three very different Philadelphia communities were created and exhibited as part of Philadelphia's Festival Mythos. Based the myths and rituals of Puerto Rico's indigenous Taino Indians, Kachi Katsí  Sun-Moon in Taino  traced a cycle of individual and community birth, demise, and rebirth. The artists uncovered and revealed the transference of Taino culture to local Latino history and symbology through research in the neighborhood, its botánicas (spiritist stores) and its people. Barrio children assisted in the creation of the installation, while the Norris Square Senior Citizens participated in the development of the performance script. Town meetings uncovered common denominators for the wildly diverse "community" of Rittenhouse Square  from affluent high-rise dwellers to the homeless. "Confessionals" were set up in the Square, a place of casual access where many people pass by and through. Anonymous and entwining stories of solitary lifestyles, gathered from the Rittenhouse community-at-large, emerged and engaged people to listen while they remained in public view. The piece highlighted the process and registration of human interaction, the way we are perceived by others and by ourselves. The Public Life of the Secret Writer explored the influence of race, poor nutrition, and dereliction on the poetry/poverty of street-culture. While in residence with the homeless in Philadelphia's LOVE Park, the artist learned from street-writers who jot in private and guard their writings with their lives. Simply by existing in so hostile an environment, these texts are testament to the urgency, strength, and courage of their authors. This nomadic street-theater work traced the daily patterns of a group of local homeless men. The piece culminated with a performance lecture at Reading Terminal Market, followed by community service at St. John's Hospice for Men.